Jean-Christophe Kugler holds an engineering degree from Ecole Centrale Nantes. He joined the Process Engineering R&D Center at Renault in 1984. In 1989, he became Section Manager, Quality Control Engineering before moving to the Maubeuge site in 1994 as Head of the Quality Department for the launch of Kangoo. In 1998, he took charge of the Quality Department at the Cordoba site in Argentina. In 2000, he was named Head of Production Vehicles with the Painted Body Engineering Department at Guyancourt, then Head of Body Shop Engineering from 2002 to 2005 and Assistant Director from 2005 to 2006. From 2006 to 2008, he was Director of the Small Commercial Vehicle Program and then the B Range Program. 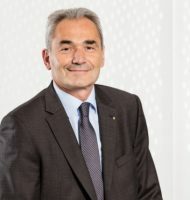 On 1 October 2008, Jean-Christophe Kugler was named Senior Vice President, Light Commercial Vehicles Division. He joined the Renault Management Committee in 2009. On 1 November 2011, Jean-Christophe Kugler was appointed Senior Vice President, Euromed Region Management Committee (RMC) Leader. In October 2014, he was appointed Senior Vice President, Chairman of the Eurasia Region, reporting to Jérôme Stoll, Chief Performance Officer and Executive Vice President, Sales & Marketing for Groupe Renault. Since 1 April 2016, Jean-Christophe Kugler has been Executive Vice President, Chairman of Europe Region. He is a member of the Renault Executive Committee.